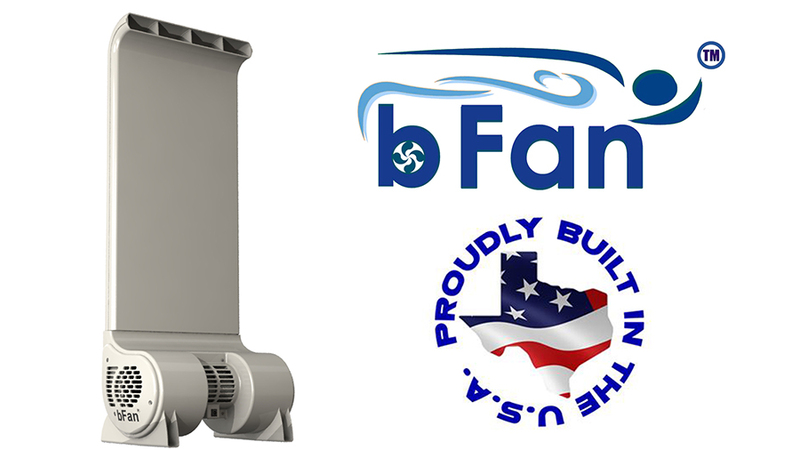 The bFan® is for people who want to save money on their air conditioning bill and not go broke trying to sleep cooler. 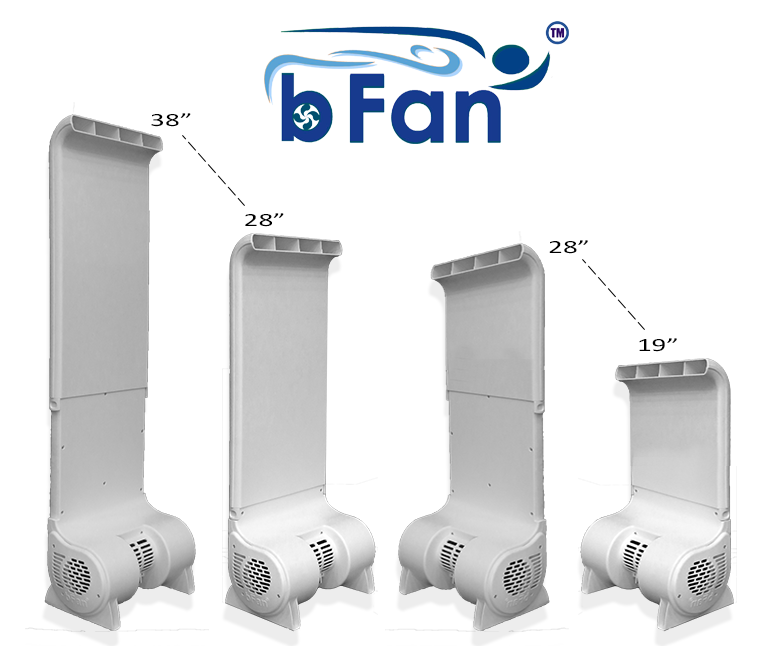 The bFan® is for people who are hot sleepers and really want to sleep cooler or have cooler sheets at night. The top will extend from 19” tall to 37” tall. The air duct is 12” wide and ¾” deep. The base is 6.25” tall X 7” deep and 12” wide. The base can be set in any direction, either under the bed or pointing outward from the bed. It can be place anywhere around the bed from the foot to the top and anywhere along the side of the bed. 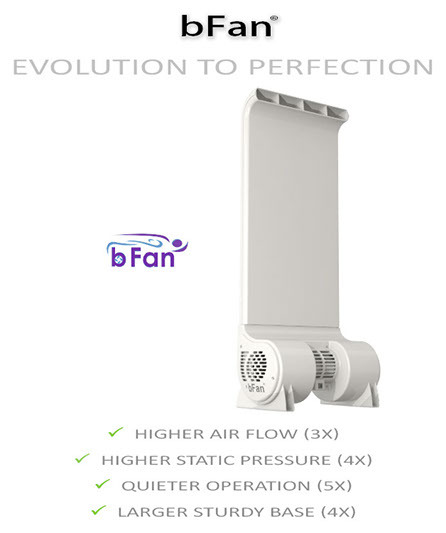 The NEW bFan® will help you sleep cooler, stop night sweats, ease menopause night sweats, eliminate sleeping hot, put an end to sleepless nights, or even save money on your air conditioning. The Bedfan cooling system or our new bFan® is for you. They are built here in Texas using U.S. made parts and select imported parts with American ingenuity and American workers. When you buy our American produced fans you are helping more than 10 other American companies. How The-bFan works from The bFan® on Vimeo. "I never write letters to companies regarding their products, But i had to this time. I just wanted you to know. The first night I used my bed fan i wanted to test it out to the max. So I set it up as normal, with the top sheet nicely tucked in and around the fan. Then i added my duvet on top of that along with my comforter. I could not stop laughing when i turned the Bedfan up all the way and i was laying there in a cocoon of refreshing air.. It LIFTED ALL of it right off the bed.. The sheets, the duvet and the comforter.. WOW.. I stopped laughing, turned it down and went to sleep. This thing can really put out if you need it. Thanks for a wonderful product and a wonderful nights sleep, FINALLY. Not fancy, but it works like a champ." Cyndi from Delaware..
Where are your fans made ? Since the very beginning in 2003 when we first started making our Bedfan, (the original) we have been building them in Texas. Our first production facility was actually in our garage in Snook Texas, a small town just outside of Collage Station Texas. My wife, children, family and in-laws all pitched in to make this dream come true. Soon people started seeing the Bedfan on TV and reading about it in the news papers, on line as well as hearing radio interviews that I did. At that point it got to be really hectic in our garage. I would get all kinds of people helping out just to keep up with the catalogs and retailers. It was fun but we soon out grew that. Eventually we decided to move all of our production into Boerne Texas. Boerne is where we started and in a small house on river road. I spent many late night hours making prototypes and testing various designs. Boerne is also the town where my friends have an injection molding company called Bee Jay Molding. It was with their guidance and patience that I took my idea and turned it into a reality. Still to this day we build the Bedfan in Boerne Texas, we do have to import a few parts from over seas but that is only because so many factories have closed up shop in the U.S. and moved where the labor is cheaper. I made a promise that if I was ever blessed enough to have the opportunity to build a product that would help people, I would build it here, and do my part in keeping jobs in America. I have kept that promise and will always as long as God is willing to let me. The Bedfan - conceived, designed, manufactured and built in Texas, always. What is your Bedfan warranty like ? We do all that we can to assure you that you are getting the highest quality possible. It is not uncommon for these units to last 5 or six years. But inevitably there will be some that can develop issues. Usually this happens in the first few months if its going to happen at all. When that happens we always replace the unit and make sure that you are satisfied. We will do this for up to one year. After that year if you run into an issue with the Bedfan we will work with you to get the problems resolved. One way or another we will get you back on track. I know that some have said, the customer is ALWAYS right, well that is exactly how we look at this. If your not happy, I'm not happy. Once you own a Tompkins Bedfan you are part of a family and we will be here to take care of you when ever you have a problem. So rest assured, your satisfaction is my utmost desire and when it comes to making decisions, or taking the blame, The buck stops here. You are what keeps us in business, you are the most important person to us. Is your Bedfan Remote Wired or Wireless ? In this modern day age of technology I find myself longing for the days of simplicity. Where you didn't four remotes to just to watch TV. Where you didn't have to plug all your gadgets in to keep everything charged up. Where your bedside table had a book or two and a lamp to read by. Not where you have phones, I-pads, alarm clocks, chargers, books, papers, prescription bottles, drink cups and more. No I don't think there is any more room for one more gadget, one more appliance on my bedside table. One more remote that needs batteries. One more remote that gets lost. One more remote that falls on the floor and gets broken. No more remotes. Will the Bedfan system get in my way ? The Bedfan is designed to stay out of your way. Even when you change your sheets. You simply put your bottom sheet on as normal and throw the top sheet over the fan and tuck it in. Nothing changes. What about the Bedfan Power cord? The small, extra long cord comes from the side of the Bedfan Cooling system so that nothing is sticking out from the bed. You simply run the cord under your bed and plug it in. Out of sight out of mind. All UL compliant. Will my partner get cold ? The breeze that is created by the Bedfan travels the path of least resistance. You place the Bedfan at the foot of the bed on your side and the breeze travels along the sides of your body. It is restricted from moving to the other side of the bed. How do I control the Bedfan ? Much like a volume control on a radio the Bedfan can be turned up all the way or completely off. You can run the fans at any speed you like. Most people use it at about 15% of available power. This also makes it last longer. The controller can be placed under your pillow or on your night stand. Is The Bedfan Cooling System safe? It is very safe. All parts, plastic, fans, power supply etc.. have been rigorously tested by Underwriters Laboratories. Is this only for people with night sweats? The Bedfan is for everyone that wants to sleep deeper, cooler and fuller. Some people just want to save money on their Air-conditioning bill and some people are dealing with night sweats for countless other reasons. The Bedfan works for everyone that wants a cooler more comfortable night of sleep. Sure has a lot of power, Why is this? When a car manufacture chooses an engine for a specific car they don’t chose one that will give you just enough power to make the car move. They deliver the car with 5 or more times as mush power as you would need. The main reason for this is so that your engine will last longer. If you only use 20% of the available power your engine will last 5 times longer. If you used 100% of the power all the time your engine would not last long at all. That is the same thought that we put into the development of the Bedfan ®. Although you can raise the power to 100% and get a lot of air out if the fan, the normal operation is around 20% of available power. It is very quiet at this level and very efficient. Your fans should operate perfectly at this speed for a long time. Will my feet get cold? When you use the Bedfan for the first time, you most likely keep the temperature very cool in your home. We suggest that you raise the thermostat a couple of degrees and turn up the Bedfan until you find your personal comfort zone. You will use less air condition, save money and enjoy a better night’s sleep! I used to set my thermostat at 68 degrees every night. After developing the Bedfan, I now set it around 79 degrees! How will it stop my night sweats? This is the original Bedfan. We came up with this idea in early 2002 while living in Boerne Texas, We started production soon after that. Any other version on the market is not the original and is not made in Texas like ours, they are most likely made in China. Copyright 2005 - present - Tompkins Research, Inc. & Kurt W. Tompkins All Rights Reserved DO NOT COPY.bFan® and the word bfan® in any format is a registered trademark of Kurt W. Tompkins the word BFAN® in any format shall not be used without written permission of the mark owner. This includes specifically Brookstone where you like to bait and switch, do not use my mark to bait customers.